I’ve been invited to do an online magazine submission. 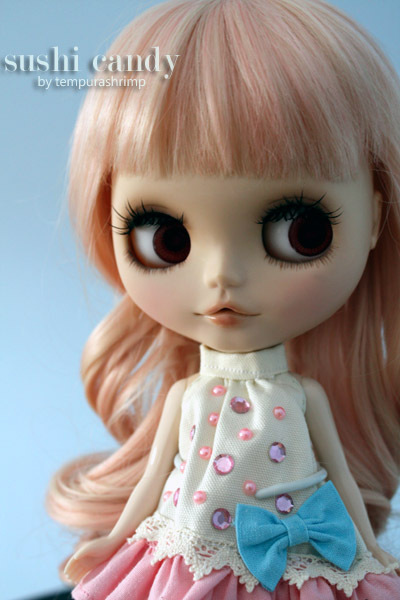 I was hoping to do a Pullip project but I don’t know when my Pullip will arrive so I’ll be using my Blythe. Givenchy is a custom Blythe I bought off Yahoo! Japan Auctions. I will be doing a fairy outfit for her. If my Pullip arrives on time, I’ll make something for her too. I will be naming my Pullip – Chanel. Two of my fave designers of all time. I just can’t help myself. This means my hoop Dorothy will be on hold for a bit. It is prepped and I may do the felt appliques in the meantime. I’m always excited to see what things you come up with Rosey. I hope to sew more for Bijoux soon, but it’s the pattern drafting that has me in a pickle right now :3 Good luck with your plans! You are currently reading Blythe Project at Sushi Candy.